Vascular anomalies. Infantile hemangioma. Coronal contrast-enhanced T1-weighted image shows the classic MRI appearance of infantile hemangioma. A well-rounded homogeneously enhancing cervical mass is associated with high-flow vessels (signal voids) in and around the mass. Most of these lesions require no additional testing for diagnosis. Vascular anomalies. Kaposiform hemangioendothelioma (KHE). Axial T2-weighted MRI obtained through the face shows an extensive soft-tissue abnormality in the right facial area that involves the adjacent osseous structures and extends into the oropharyngeal structures; it results in significant airway narrowing. Vascular anomalies. Arteriovenous malformation (AVM). 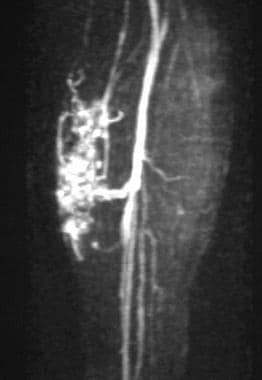 Contrast-enhanced magnetic resonance angiogram (MRA) shows a nidus and early draining veins in the forearm. Vascular anomalies. Venous malformation (VM). Axial CT image of the pelvis shows a mass that contains multiple phleboliths. Although CT is not the imaging modality of choice for VMs; however, phleboliths and osseous changes, in some cases, are best appreciated on CT scans. Vascular anomalies. Lymphatic malformation (LM). 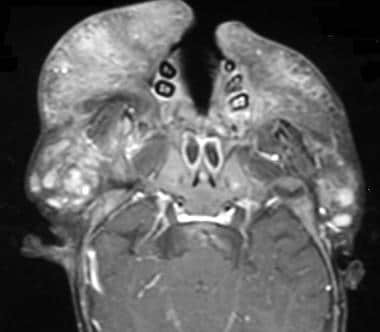 Axial T2-weighted MRI shows an extensive soft-tissue abnormality involving the neck, face, and oropharyngeal structures. The lesion has inhomogeneous hyperintense signal and causes significant airway compression. Misclassifications or incorrect diagnoses are common and are usually due to the limited experience of the clinicians or radiologists involved in the diagnosis and management of vascular malformations. Use of an inappropriate imaging modality (eg, CT instead of MRI) and poor image quality can also contribute to this clinical dilemma. The most common misdiagnosis or misconception is the use of the term hemangioma to mean venous malformations (VMs). This misconception can easily lead to incorrect triaging and mistreatment. For example, patients are commonly treated with steroids because the interpretation of a hemangioma lesion on the imaging study (eg, MRI). Another common diagnostic dilemma is arteriovenous malformation (AVM). Often, the malformation is called an AVM although all clinical and radiologic findings are characteristic of a low-flow vascular anomaly (eg, VM). Therefore, recognizing a vascular malformation and appropriately classifying the malformation is essential for optimal patient care and requires solid knowledge and experience. Vascular anomalies. Infantile hemangioma. 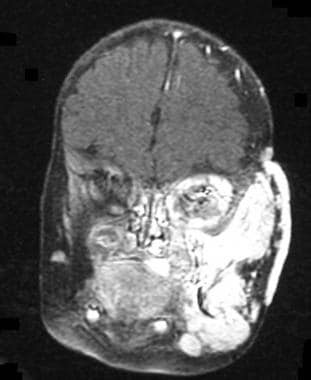 Coronal contrast-enhanced T1-weighted MRI of an infant's head shows a large facial mass lesion that involves the skin and that extends into the left orbit. Small tubular hypointensities are seen; these are consistent with flow voids and represent high-flow vessels in the lesion. On the basis of the imaging features and the patient's age, these findings are consistent with infantile hemangioma. Vascular anomalies. Sinus pericranii. 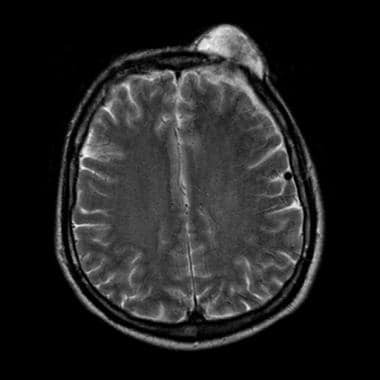 Axial T2-weighted MRI shows an extracranial hyperintense scalp lesion (VM) with an underlying osseous defect. An area of hypointense signal is present within the epicenter of the calvarial defect; this is consistent with a flow-related signal void. Vascular anomalies. Venous malformation (VM). 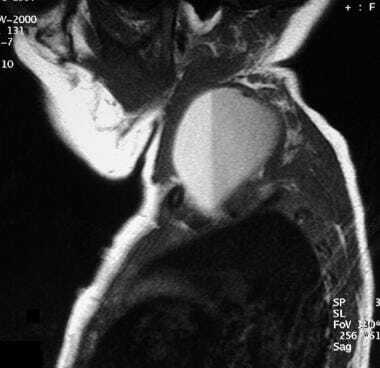 Sagittal contrast-enhanced T1-weighted MRI shows a typical VM lesion in the suprapatellar bursa region with easily noticeable patchy contrast enhancement. Although most of the lesion is behind the quadriceps tendon, the lesion appears to extend anteriorly. Patients with VMs may have intraarticular hemorrhage, which may or may not be associated with articular cartilage damage (degenerative hemarthrosis). MRI is commonly performed without a gradient-echo sequence or without the intravenous administration of contrast material. T2-weighted images are mainly used to evaluate the extent of the abnormality; GRE images are used to identify the hemodynamic nature of the condition (high- vs low-flow lesion), and contrast-enhanced images are used to determine the extent of the malformation and to distinguish slow-flow vascular anomalies (VM versus lymphatic malformation [LM]). For any vascular anomaly, the basic approach is, first, to evaluate fat-suppressed T2-weighted images to determine the extent of the anomaly and, second, to evaluate the GRE images to decide whether the anomaly is a high-flow lesion. If the anomaly is a low-flow lesion, AVM, arteriovenous fistula (AVF), and hemangioma can be excluded from the differential diagnosis. Slow-flow vascular anomalies (VM, LM, capillary-lymphatic-venous malformation, and combined malformation) can be further differentiated on the basis of their morphologic appearances and contrast enhancement patterns. If the anomaly has no contrast enhancement or a minimal degree of peripheral contrast enhancement (rings and arcs), LM should be considered foremost in the differential diagnosis. If the anomaly has easily noticeable patchy areas of contrast enhancement, VM should be suspected. If the lesion is a high-flow anomaly, the differential is limited to AVM, AVF, and hemangioma. In patients aged 5 years and older, hemangioma can be safely excluded. Noninvoluting hemangiomas and intramuscular hemangiomas occur in the adults, but they are rare. 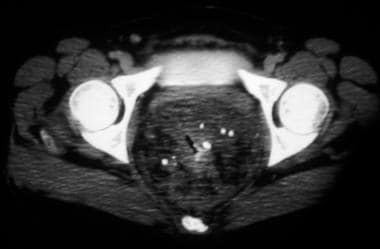 When a high-flow anomaly is found, a malignant tumoral mass should also be considered in the differential diagnosis. In hemangiomas, fast-flow vessels are usually at the periphery of the mass, and the mass usually enhances homogeneously, whereas in a malignant tumoral mass, vessels have a random distribution, and enhancement is usually inhomogeneous. A mass lesion is not expected in AVMs, although some AVMs, particularly those encapsulated by the muscle fascias, may have masslike enhancement; these can be confused with a tumoral mass. Vascular anomalies. Venous malformation (VM). Contrast-enhanced magnetic resonance angiogram (MRA) shows both arteries and veins in the upper body. A small VM is present in the right axillary area; it consists of a group of small abnormal veins. No abnormalities are seen in the other parts of the vasculature. 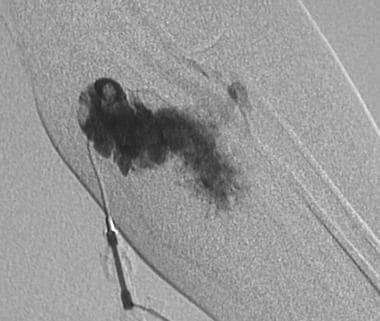 The advantage of this technique relative to conventional angiography is that MRA permits the production of multiangular reprojections, it uses no ionizing radiation, and its contrast materials are less toxic than those of other modalities. However, the technique is not yet standardized, and imaging characteristics are not well documented. Vascular anomalies. Klippel-Trenaunay syndrome (KTS). Magnetic resonance venogram (MRV) shows a large marginal vein in the lateral aspect of the thigh. The deep veins in both lower extremities appear patent. 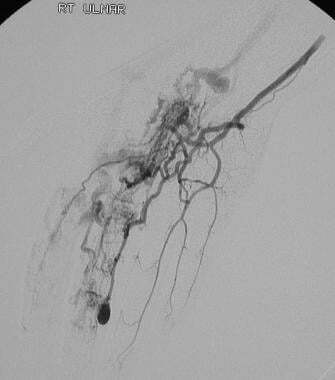 MRV has replaced the traditional contrast-enhanced venogram in determining the patency of the deep venous system in patients with KTS. This determination is crucial before surgical debulking is performed. Duplex US, continuous-wave Doppler US, color Doppler US, and Doppler spectral analysis are all useful in the evaluation of vascular malformations. Additionally, Doppler spectral analysis can be used to differentiate arterial from venous flow. However, an experienced sonographer or radiologist is necessary for appropriate sonographic evaluation. Vascular anomalies. Arteriovenous malformation (AVM). Pelvic digital subtraction angiogram obtained in a middle-aged women who presented with pelvic pain after childbirth shows an extensive AVM in the sidewalls of the pelvis, with multiple small feeders from both internal iliac arteries. The common and external iliac arteries appear normal. Vascular anomalies. Arteriovenous malformation (AVM). Image obtained in a slightly delayed phase of the same arterial injection shows a large area of intense contrast material accumulation (predominantly in the left sidewall of the pelvis) and multiple large draining veins. Arteriography has no diagnostic value in the assessment of low-flow anomalies. However, venography and direct intralesional contrast material injections are usually performed during an interventional procedure for low-flow vascular anomalies (particularly VMs) to confirm the diagnosis and to tailor the procedure (sclerotherapy). Occlusive venography can be helpful for a better assessment of the extent of low-flow vascular anomalies. Overall, plain radiographs have limited value in the diagnostic workup for vascular anomalies. However, plain radiographs can demonstrate phleboliths (characteristic of VMs), and they are helpful in the evaluation of leg-length discrepancies and/or osseous involvement. Hemangiomas generally affect the head and neck. The trunk and extremities are less commonly involved. Some hemangiomas are easily noticeable (superficial), whereas others are deeper and may have healthy overlying skin or only slightly bluish skin discoloration. Most hemangiomas are easily diagnosed without any additional diagnostic tests (eg, MRI). Deeper hemangiomas or questionable superficial lesions, however, may require imaging studies to confirm the diagnosis and to evaluate their extent. US may be used during the initial assessment or in place of MRI if it is unavailable. The characteristic MRI findings in the proliferation and plateau phases include a focal, lobulated soft-tissue mass that is isointense relative to muscle on T1-weighted images and hyperintense on T2-weighted images. It has diffuse and homogeneous contrast enhancement and dilated feeding and draining vessels within and around the mass, as shown in the images below. During the involutional phase, decreasing vascularity, decreasing enhancement, and progressive fibro-fatty replacement of the tumor is present. As the hemangioma involutes, fatty replacement can easily be recognized on MRIs, which demonstrate fat signal intensity with some residual prominent vessels. Lesions adjacent to bone may cause smoothly marginated erosion of the bone. Phleboliths and calcifications are not features of hemangiomas. As mentioned earlier, if the patient is older than 5 years of age, another type of tumoral mass (eg, fibrosarcoma) should be favored in the differential diagnosis, and biopsy may be required. When a high-flow lesion is noted on noninvasive studies, a biopsy should be performed carefully because the risk of significant bleeding is high. Angiography may be necessary for embolization of associated spontaneous hemorrhage. On angiograms, hemangiomas appear as well-circumscribed masses that have a lobular architecture with intense and persistent tissue staining. Prominent and early draining veins may be present. Less intense tissue staining is evident with involuting lesions. At imaging study, the differential diagnosis includes other neonatal and infantile tumors, particularly soft-tissue sarcomas. In general, hemangiomas are characterized by discrete margins, relatively homogenous signal intensity, and homogenous contrast enhancement, whereas sarcomas tend to be heterogeneous. Biopsy is usually performed to assess indeterminate masses. Noninvoluting hemangioma and intramuscular hemangioma are rare conditions and occur in older children and adults; both of these have imaging characteristics similar to the aforementioned findings in infantile hemangiomas. Presurgical embolization is commonly used with both of these entities. Kaposiform hemangioendothelioma (KHE) is a vascular tumor associated with the Kasabach-Merritt phenomenon, which is severe coagulopathy due to platelet trapping resulting in spontaneous hemorrhage. These tumors are histopathologically distinct from the common hemangiomas of infancy. KHE may be present at birth in neonates, or they can develop in infants within the first few months after birth. A truncal location is the most common site. An ill-defined purpuric mass is a common presentation of KHE. The tumor is associated with extremely low platelet counts and markedly decreased fibrinogen levels. KHE has a mortality rate of 24%, which is related to coagulopathy or complications of local tumor infiltration. The MRI findings of KHE also clearly differ from those of common infantile hemangioma. In contrast to common hemangioma, KHE characteristically involves multiple tissue planes, with cutaneous thickening, subcutaneous stranding, and edema, as shown in the image below. Gradient-echo images may demonstrate hemosiderin. Superficial feeding and draining vessels are less frequent and less prominent than with common hemangioma. Destructive osseous changes in the adjacent bones are common in KHE, whereas only some remodeling occasionally occurs in infantile hemangiomas. Common symptoms include pain, overgrowth, ischemia, hemorrhage, and heart failure. Hemorrhage is usually minor, but it may be catastrophic; it typically occurs with tooth eruption or dental extraction in patients with AVM of the dental arcade. Although Schobinger has introduced a clinical staging system (stages 1-4) that clinicians commonly use to describe the degree of progression, a radiologic staging system has not yet been established. A stage I lesion has a pink-bluish stain and warmth. Doppler ultrasonography reveals arteriovenous shunting. In stage II, the lesion has pulsations, thrill and bruit. In stage III, the patient has dystrophic skin changes, ulceration, bleeding and pain. Finally, in stage IV, the patient has high-output cardiac failure. Extremity AVMs are relatively common. They may be single or multifocal in the extremity, or they may be diffuse and involve the entire extremity and adjacent trunk. Head and neck AVMs differ somewhat because of their catastrophic complications, which include bleeding from dental manipulation (common in dental arcade AVMs) and the potential risk of stroke when they are embolized. Pulmonary AVMs or AVFs usually cause cyanosis, clubbing, and polycythemia, as well as cerebral infarcts and abscesses (due to loss of the normal filtering function of the pulmonary vasculature). AVMs involving the lungs and/or gastrointestinal system are common in Rendu-Osler-Weber syndrome (hereditary hemorrhagic telangiectasia [HHT]). In the bowel, the lesions are that of small hemangioma-like abnormalities without angiographically demonstrable arteriovenous shunting. Hepatic involvement by HHT shows increased hepatic arterial vascularity, giving the appearance of dirty hepatic arteriogram, which may cause significant arteriovenous shunting. Vascular anomalies. Arteriovenous malformation (AVM). 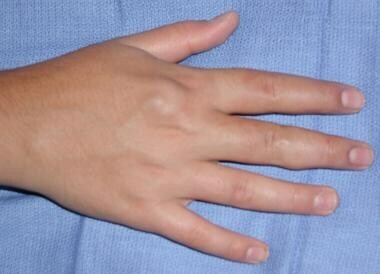 Photograph of the right hand of a patient shows soft-tissue swelling but no skin discoloration. Vascular anomalies. Arteriovenous malformation (AVM). A young boy presented with soft-tissue swelling and pain in the right hand. Arteriogram of the right arm (ulnar artery injection) shows an AVM with multiple feeders. 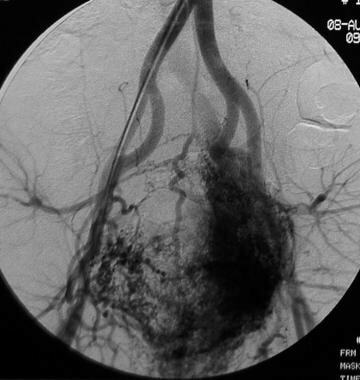 Multiple, large, early draining veins and aneurysmal lesions are depicted. On MRIs, the anomaly is characterized by enlarged vascular channels associated with dilated feeding and draining vessels. A discrete soft-tissue mass is typically absent. However, masslike perilesional soft-tissue signal-intensity changes and contrast enhancement may occur. This masslike appearance is usually observed when an AVM is confined to a muscle sheath; this may make differentiation between an AVM and vascular tumor difficult. Abnormal arteriovenous connections are easily recognizable on MRIs as linear or punctuate signal voids (spin-echo imaging) or as hyperintensities (gradient-echo images). Skin thickening and increased fat deposition may be seen in association with AVMs. On MRIs, osseous involvement can be seen as lytic bone expansion, lacy osseous changes, and /or cortical thinning. The feeding and draining veins in the involved body part are usually prominent. MRA and MRV, as shown in the images below, may be useful noninvasive imaging modalities to confirm the high-flow nature of the lesion and to map out the feeding and draining vasculature. Arteriography is usually required to evaluate of the abnormality in more detail during embolotherapy. AVFs vascular anomalies may involve any organ system. They are usually symptomatic in young patients because they can cause high-output cardiac failure. A pulsatile mass or a bruit can be found at physical examination. AVFs are generally curable with endovascular interventions. The characteristic physical finding is a soft and easily compressible soft-tissue mass (or swelling) that is associated with bluish skin discoloration (see the images below). Increasing engorgement with dependency is typical. They can be small and localized or extensive and involve the entire extremity or body part. Although VMs are considered benign entities, some extensive VMs can result in significant morbidity, particularly those in the head and neck (eg, airway involvement). Several syndromes such as Klippel-Trenaunay syndrome (KTS), Maffucci syndrome, and blue rubber bleb nevus syndrome (BRBNS) are characterized by VM-like slow-flow vascular anomalies. Vascular anomalies. Venous malformation (VM). Photograph of a young child shows a facial venous malformation that appears as a bluish skin discoloration without a mass. Vascular anomalies. Venous malformation (VM). Image shows a small VM in the lower lip, which is characterized by bluish mucosal discoloration and mild soft-tissue swelling. Head and neck VMs are variable in size; they range from tiny lesions to huge vascular malformations that cause a significant facial asymmetry and progressive distortion. 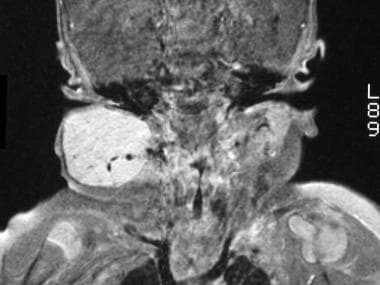 Some of these large VMs are associated with sinus pericranii and developmental intracranial venous anomalies (see the image below). Large pharyngeal, laryngeal, and deep cervical-oropharyngeal VMs can expand to compress the airway and cause significant deviation that requires tracheostomy in most cases. Extremity VMs may be associated with a limb-length discrepancy, particularly if the malformation is large. Intraosseous VMs can cause structural weakening of the osseous shaft and pathologic fractures. Involvement of a joint by VM may result in hemosiderin-arthropathy due to repeated intraarticular bleeding, which is typically seen in the knee (see the image below). VMs of the gastrointestinal tract most commonly cause chronic bleeding and anemia, and they may be part of BRBNS. Lesions that involve the foregut can be associated with portal venous anomalies (absence of the portal vein, portal hypertension, etc). Glomangioma, or glomovenous malformation, is an autosomal dominant disorder that is characterized by multiple, often tender, blue nodular skin VMs. Although this entity differs from typical VM because of the presence of numerous glomus cells (immature smooth muscle cells) that line the ectatic vascular channels at histopathologic study, whether the images of typical VMs and glomangiomas differ has not yet been determined. Another familial condition associated with multiple VMs is the familial cutaneous mucosal VM, in which dome-shaped cutaneous lesions of various sizes develop progressively over time. The diagnosis of a VM is usually straightforward at clinical examination, although indeterminate lesions are usually confirmed with imaging studies. Imaging is also used to assess the extent of the abnormality, as well as possible associated abnormalities. The most typical radiographic finding is a soft-tissue mass or prominence containing phleboliths (see the image below). Osseous involvement may be apparent as focal areas of cortical thinning with increased trabeculae. VMs are high-signal-intensity lesions on T2-weighted images and low-signal-intensity lesions on T1-weighted MRIs; they have lobulated margins and multiple, rounded, signal voids that represent phleboliths. Phleboliths are usually better demonstrated on plain radiographs or CT scans. Fluid-fluid levels may rarely be present, although these are more suggestive of a low-flow vascular anomaly with a lymphatic origin (eg, LM). Aside from a small percentage of VMs, high-flow vascular signal voids and flow-related enhancement are not features of VMs. VMs (see the images below) may involve only the skin, or they can extend into the muscles, joints, and bone. Prominent or dysplastic draining veins may be identified with either MRI or direct intralesional contrast agent injections. Enhancement of the abnormal vascular channels is typically seen on MRIs after the intravenous administration of gadolinium-based contrast material. The contrast enhancement pattern allows the differentiation of VMs from other low-flow anomalies, particularly LMs (enhancement is more patchy and central in VMs, whereas no enhancement or minimal peripheral enhancement is seen in LMs). Vascular anomalies. Venous malformation (VM). Direct intralesional contrast injection outlines the vascular anomaly with faint opacification of the draining veins and a few rounded filling defects that represent phleboliths. These imaging features are characteristic of VMs. Vascular anomalies. Venous malformation (VM). 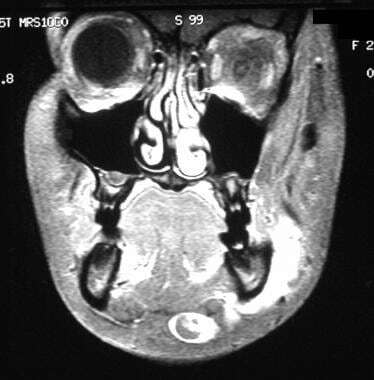 Coronal T2-weighted MRI of the face shows a homogeneously hyperintense lesion in the lower left facial area. On the basis of this appearance alone, the main 2 differential diagnoses should be VM and lymphatic malformation (LM). Because this lesion has obviously intense contrast enhancement, the diagnosis is VM. Vascular anomalies. Venous malformation (VM). 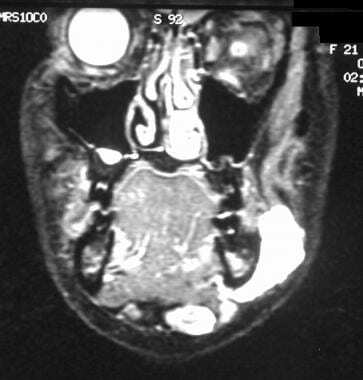 Coronal contrast-enhanced T1-weighted MRI of the face shows a focal soft-tissue abnormality in the lower left facial area. The lesion enhances significantly and homogenously. In the head and neck, VMs should also be differentiated from brachial cleft cysts, foregut duplication cysts, and thyroglossal duct cysts. If a VM involves a joint, the joint is best assessed with MRI, in terms of articular cartilage damage. 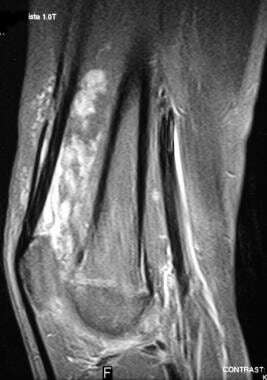 The compartment syndrome is a particular concern after sclerotherapy in the extremity VMs. Therefore, the determination of the precise anatomic relationship between the VM and the neurovascular bundles is mandatory on MRIs. If a cervicofacial VM is found, the patient should be assessed for the possibility of sinus pericranii, which may be best performed with carotid arteriography and/or direct intralesional injections of the contrast agent. Although the demonstration of such a sinus has been reported with MRA, conventional angiography (digital subtraction angiography [DSA]) is usually required for complete evaluation of the intracranial circulation. The diagnosis of a gastrointestinal VM is problematic. Because MRI is not sensitive enough to depict small gastrointestinal VMs, endoscopic examination of the gastrointestinal system is usually required. Patients with large intraabdominal VMs should also be examined to rule out portal hypertension. When a patient presents with gastrointestinal bleeding and when BRBNS is suspected, the presence of characteristic cutaneous vascular lesions (soft, blue, sometimes nodular lesions) should be assessed. 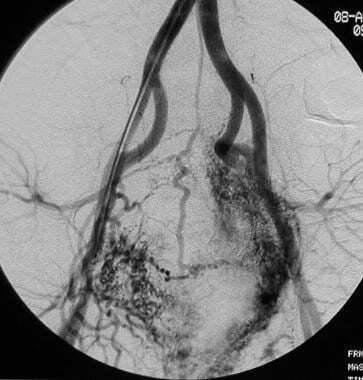 Angiography may be necessary if the diagnosis remains in doubt or when associated anomalies, such as sinus pericranii or small AVFs, are suspected. The venous channels are usually faintly filled-in on venous-phase angiograms (see the image below). LMs are usually apparent in young children. These malformations appear in various forms, including as localized small lesions, or in the diffuse involvement of an extremity or particular body part or organ system. LMs are usually classified as microcystic, macrocystic, or mixed. The medical term cystic hygroma, which was commonly used for macrocystic LMs located in the neck, is no longer used in modern medical terminology. Most LMs (approximately 75%) occur in the cervicofacial region. The overlying skin can be healthy, or it may have tiny characteristic vesicles. Cervicofacial LMs may be associated with the overgrowth of the mandibular body. LMs of the floor of the mouth and tongue are usually characterized by vesicles, swelling, and bleeding. In most cases, the airway is involved to some degree. LMs of the orbit typically cause proptosis (sudden proptosis is usually due to intralesional bleeding), which may require surgical or interventional decompression to save the optic nerve. Mediastinal LMs often accompany cervical LMs and/or axillary LMs. LMs in an extremity can cause diffuse or localized swelling with soft-tissue and skeletal overgrowth. When located in the pelvis, LMs are usually associated with bladder outlet obstruction, constipation, or recurrent infection. Disappearing bone disease (Gorham-Stout syndrome) is a rare disease entity that is considered an LM with progressive osteolysis. Most cases are clinically obvious and require no imaging studies for diagnosis. However, MRI is particularly useful to fully evaluate this abnormality (see the images below). Interestingly, cysts in microcystic LM are usually too small to identify on images; therefore, microcystic LMs may easily be confused with other solitary masses or soft-tissue abnormalities. Vascular anomalies. Lymphatic malformation (LM). 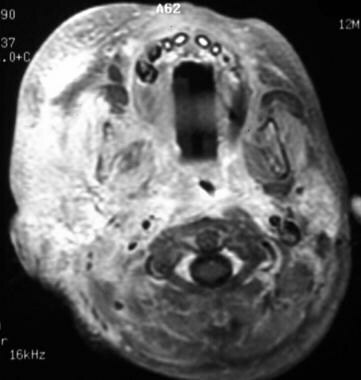 Axial contrast-enhanced T1-weighted MRI shows an extensive LM involving the neck and face. The degree of enhancement is somewhat more than expected for an LM; however, typical enhancement (rings and arcs) is seen, particularly on the left side. Relatively large, rounded, strongly enhancing structures (representing large abnormal veins) are seen; these are common in extensive LMs, although, in some cases, they may be considered evidence of lymphatic venous malformation (LVM) rather than a pure LM. The MRI findings of LM are characteristic. The cysts have low signal intensity on T1-weighted MRIs and marked hyperintensity on T2-weighted MRIs. Fluid-fluid levels within the cysts are common. Similar to VMs, high-flow vascular signal voids and flow-related enhancement are not expected in LMs. After the intravenous administration of contrast material, the lesion may show mild enhancement of the septae and walls, which creates a characteristic enhancement pattern (rings and arcs). Most LMs, however, are not enhancing; this is the most apparent difference between LM and VM on MRIs. With microcystic lesions, the enhancement pattern may appear to be more solid compared with that of macrocystic LMs, and it may be confused with other soft-tissue abnormalities. Occasionally, enhancement of the cysts may be seen after LMs are treated (with either surgical or intralesional injection) or in mixed lymphaticovenous malformations. Large and/or anomalous venous channels are often seen. In Gorham-Stout syndrome (disappearing bone disease), bone lesions are best demonstrated with T2-weighted spin-echo images. MRL shows the dilated or interrupted lymphatic channels, especially those in the limbs. The characteristic imaging feature of macrocystic LM of the neck (cystic hygroma) is a single large cyst just posterior to the parotid gland, with or without septae (see the image below). These macrocystic LMs usually demonstrate fluid-fluid levels. Pharyngeal cleft cysts should be carefully excluded. LMs of the floor of the mouth and tongue are usually microcystic and diffuse, and they usually have minimal or no contrast enhancement. In the extremities, LMs may be similar to VMs, particularly on T2-weighted images, although no contrast enhancement is expected in LMs. Contrast enhancement is typical of VMs. Vascular anomalies. Lymphatic malformation (LM). Sagittal T1-weighted MRI of the upper body shows a large cystic lesion with a fluid-fluid level, consistent with a macrocystic LM. This condition was previously termed cystic hygroma. These lesions can be easily treated with sclerotherapy. A surgical excision of these lesions is also considered a relatively simple and safe procedure in most cases. Angiographically, LMs are usually avascular lesions, although a prominent capillary blush can be seen in lesions associated with bleeding. Anomalous and prominent veins, however, are frequently present. Although conventional contrast lymphangiography is rarely performed today, it is useful in determining the precise location of lymphatic leaks. Capillary malformations (CMs) are common birthmarks. Usually, they are diagnosed clinically. CMs can appear as a small localized lesion, or it can be extensive and associated with hypertrophy. CMs can also be a part of an underlying structural abnormality such as encephalocele, spinal dysraphism, or Sturge-Weber syndrome, for which imaging studies may be required in select cases. MRI is the imaging modality of choice with these abnormalities. In Sturge-Weber syndrome, MRIs show pial vascular enhancement, enlargement and enhancement of the ipsilateral choroid plexus, and prominent cerebral sulci. The aforementioned structural abnormalities are also easily recognizable on MRIs. Imaging, typically MRI and/or MRA, is mainly used to evaluate the extent and patency of the deep veins, as shown in the image below. MRI findings are variable because of the wide range in the severity of this disorder. The lymphatic component of the disease may be macrocystic or microcystic. Increased fat is often identified in the areas of soft-tissue overgrowth. In severe cases, the deep venous system is anomalous (hypoplastic or interrupted), and drainage occurs mainly via markedly dilated, anomalous superficial veins. The pathognomonic marginal vein of Servelle is frequently identified in the lateral calf and thigh. MRV is the imaging modality of choice in the evaluation of the patency of deep veins before attempts at surgery. 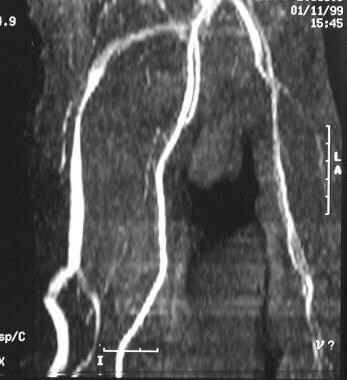 Contrast-enhanced angiography may reveal discrete microarteriovenous fistulas. The major clinical features of Proteus syndrome, a rare vascular anomaly, include verrucous nevus, lipomas and/or lipomatosis, macrocephaly, asymmetric limbs with partial gigantism of the hands and feet, and cerebriform plantar thickening. 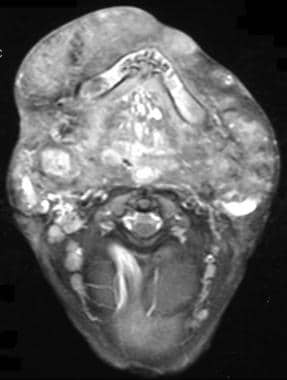 The characteristic MRI finding is abundant fat deposition in the malformation. MRA and MRV can elucidate the composition of focal masses and the underlying vascular anatomy. This rare fast-flow combined vascular malformation usually involves a lower limb, and it is usually associated with a geographic stain over the enlarged limb. Symptoms include cutaneous warmth and a bruit or thrill on clinical examination, all of which are more suggestive of a complex vascular malformation than a simple CM. MRIs and MRAs show enlarged extremity muscles and bones with an abnormal signal intensity and contrast enhancement pattern; they also show generalized arterial and venous dilatation in the involved extremity. Arnold R, Chaudry G. Diagnostic imaging of vascular anomalies. Clin Plast Surg. 2011 Jan. 38(1):21-9. [Medline]. 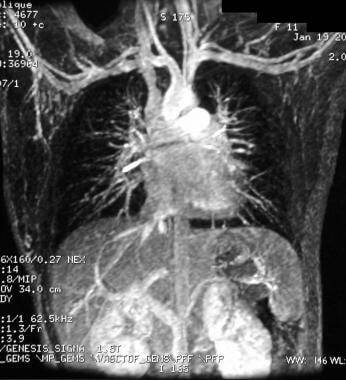 Dubois J, Alison M. Vascular anomalies: what a radiologist needs to know. Pediatr Radiol. 2010 Jun. 40(6):895-905. [Medline]. Bigot JL, Iacona C, Lepreux A, et al. Sinus pericranii: advantages of MR imaging. Pediatr Radiol. 2000 Oct. 30(10):710-2. [Medline]. Polak JF, Fox LA. MR assessment of the extremity veins. Semin Ultrasound CT MR. 1999 Feb. 20(1):36-46. [Medline]. Manole S, Oprita S, Encica S, Cotul M, Chira M, Manole V, et al. Echocardiography and imaging investigation in congenital cardio-vascular anomalies - competition or complementarity? Part I: non-cyanogenic cardiovascular malformations. Med Ultrason. 2012 Dec. 14(4):331-40. [Medline]. Koo KS, Dowd CF, Mathes EF, Rosbe KW, Hoffman WY, Frieden IJ, et al. MRI phenotypes of localized intravascular coagulopathy in venous malformations. Pediatr Radiol. 2015 Oct. 45 (11):1690-5. [Medline]. Kesava PP, Turski PA. MR angiography of vascular malformations. Neuroimaging Clin N Am. 1998 May. 8(2):349-70. [Medline]. Korosec FR, Mistretta CA. MR angiography: basic principles and theory. Magn Reson Imaging Clin N Am. 1998 May. 6(2):223-56. [Medline]. Laor T, Burrows PE, Hoffer FA. Magnetic resonance venography of congenital vascular malformations of the extremities. Pediatr Radiol. 1996. 26(6):371-80. [Medline]. Laor T, Hoffer FA, Burrows PE, Kozakewich HP. MR lymphangiography in infants, children, and young adults. AJR Am J Roentgenol. 1998 Oct. 171(4):1111-7. [Medline]. Paltiel HJ, Burrows PE, Kozakewich HP, et al. Soft-tissue vascular anomalies: utility of US for diagnosis. Radiology. 2000 Mar. 214(3):747-54. [Medline]. Li HO, Huo R, Wang XM, Xu GQ, Duan YH, Nie P, et al. High-pitch spiral CT with 3D reformation: an alternative choice for imaging vascular anomalies with affluent blood flow in the head and neck of infants and children. Br J Radiol. 2015 Aug. 88 (1052):20150005. [Medline]. Nie P, Yang G, Wang X, Duan Y, Xu W, Li H, et al. Application of prospective ECG-gated high-pitch 128-slice dual-source CT angiography in the diagnosis of congenital extracardiac vascular anomalies in infants and children. PLoS One. 2014. 9 (12):e115793. [Medline]. Valle RD, Zenteno M, Jaramillo J, Lee A, De Anda S. Definition of the key target volume in radiosurgical management of arteriovenous malformations: a new dynamic concept based on angiographic circulation time. J Neurosurg. 2008 Dec. 109 Suppl:41-50. [Medline]. Ono Y, Abe K, Suzuki K, Iimura H, Sakai S, Uchiyama S, et al. Usefulness of 4D-CTA in the Detection of Cerebral Dural Sinus Occlusion or Stenosis with Collateral Pathways. Neuroradiol J. 2013 Aug 30. 26(4):428-38. [Medline]. Fujimura S, Hori R, Hamaguchi K, Okanoue Y, Wakizaka H, Shoji K. Four-dimensional computed tomographic angiography of an arteriovenous fistula in the neck. Laryngoscope. 2013 Aug 5. [Medline]. Papadopoulos VG, Kourea HP, Adonakis GL, Decavalas GO. A case of umbilical cord hemangioma: Doppler studies and review of the literature. Eur J Obstet Gynecol Reprod Biol. 2009 Feb 27. [Medline]. Darrow DH, Greene AK, Mancini AJ, Nopper AJ, SECTION ON DERMATOLOGY, SECTION ON OTOLARYNGOLOGY–HEAD AND NECK SURGERY, et al. Diagnosis and Management of Infantile Hemangioma. Pediatrics. 2015 Oct. 136 (4):e1060-104. [Medline]. Fadell MF 2nd, Jones BV, Adams DM. Prenatal diagnosis and postnatal follow-up of rapidly involuting congenital hemangioma (RICH). Pediatr Radiol. 2011 Feb 22. [Medline]. Moukaddam H, Pollak J, Haims AH. MRI characteristics and classification of peripheral vascular malformations and tumors. Skeletal Radiol. 2008 Nov 20. [Medline]. Boussel L, Cernicanu A, Geerts L, Gamondes D, Khouatra C, Cottin V, et al. 4D time-resolved magnetic resonance angiography for noninvasive assessment of pulmonary arteriovenous malformations patency. J Magn Reson Imaging. 2010 Nov. 32(5):1110-6. [Medline]. Patel AS, Schulman JM, Ruben BS, Hoffman WY, Dowd CF, Frieden IJ, et al. Atypical MRI features in soft-tissue arteriovenous malformation: a novel imaging appearance with radiologic-pathologic correlation. Pediatr Radiol. 2015 Sep. 45 (10):1515-21. [Medline]. Elsayes KM, Menias CO, Dillman JR, Platt JF, Willatt JM, Heiken JP. Vascular malformation and hemangiomatosis syndromes: spectrum of imaging manifestations. AJR Am J Roentgenol. 2008 May. 190(5):1291-9. [Medline]. Li X, Tian J. Multidetector row computed tomography arteriography in the preoperative assessment of patients with Klippel-Trénaunay syndrome. J Am Acad Dermatol. 2009 Feb. 60(2):345-6; author reply 346. [Medline]. Sharma D, Lamba S, Pandita A, Shastri S. Klippel-trénaunay syndrome - a very rare and interesting syndrome. Clin Med Insights Circ Respir Pulm Med. 2015. 9:1-4. [Medline]. Al-Katib S, Al-Faham Z, Grant P, Palka JC. The Appearance of Maffucci Syndrome on 18F-FDG PET/CT. J Nucl Med Technol. 2015 Jun. 43 (2):131-2. [Medline].